It's the start of a new year and with my goals in place, it's time to get my calendar(s) ready to go. There is something so fun for me about filling in a new calendar. Maybe it's the possibility of the blank slate of a new year just waiting to be filled with appointments, outings, to-do's, vacations and the day to day business of life. I just love it. Last year, I created my own calendar when I did not find one that really suited my needs. I had some requests for a 2012 version so I've put it together for you. It's largely the same as last year's version but this year I changed the tiny "preview" calendar to view the next month rather than the following years corresponding month. Other than that, the calendar is the same. Also available for download is a page that you can go more into detail about your days. I would recommend printing front and back to cut down on your paper use on that one. I didn't the first time and boy was I sorry! Thanks for posting these. They will be a lot cheaper than buying a planner! Hope your new year is off to a good start. Thank you for posting these. Sorry to ask this but is there any way that you could post a PDF - the RTF has a weird format when I download it. 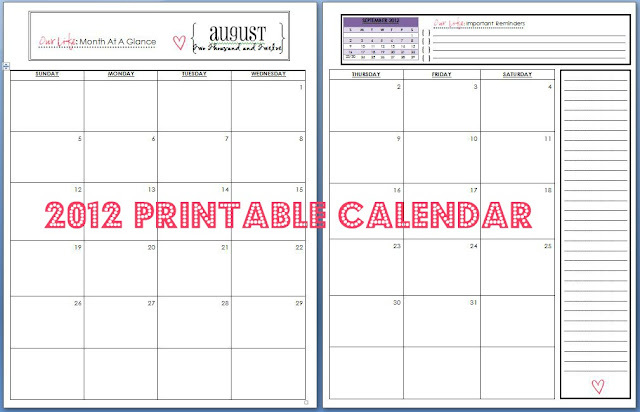 I love these printable calendars!!! I do have to ask if it is possible to post a PDF version tho. I'm having a little trouble downloading the version that is posted right now. These are awesome - thank you so much for all of your work. I am sending all my church gals to your blog to check this out. You are amazing!! I've been looking for 2012 calendars all month and I just love yours!!!! Thank you so much! You did such a great job!! Thank you for sharing! Thank you so much for sharing your hard work! Your Home binder is amazing and is going to make my life so much easier!! I LOVE your calender and all your other sheet for a family binder. But when I click on the calender it keep redirectiong me. Is there something I am doing wrong? 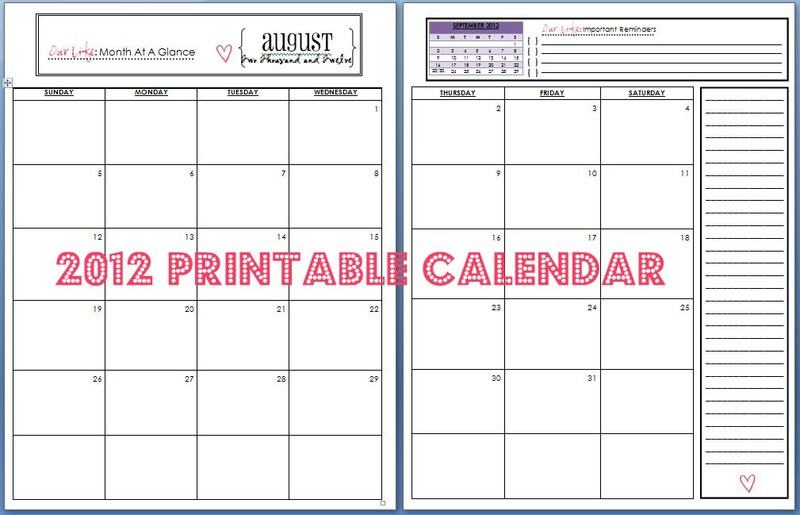 I love this calender but it keeps redirect me, and does not open like your other printables. am I doing something wrong? I LOVE your calendar...I was looking for something that would have large spaces and easy to manage. Do you by chance have one for 2013 made? I am a teacher and mother and follow the school schedule (I know, I'm one of those people). Unfortunately, I can only go through December. I would LOVE to have 2013 if you have it. Please let me know. Thanks!! By any chance do you have a 2013 version made of calendar made - its so cute! I love your monthly calendars and was wondering if you created a 2013 version yet? Thanks so much! Do you have the calendar for 2014 available? I'd like to start this project for the upcoming year. I love this!!! Any chance you have a calendar for 2014? Would love to start this project for the upcoming year. Thanks so much! I love this!!! Any chance you have a calendar for 2014? I would like to start this project for the upcoming year. Thanks so much! Awesome Job! I was wondering if you've done a calendar for 2014 yet? I love your printables so much! Is there somewhere that I can find the 2014 calendar?? I downloaded another, but its nowhere near as good as yours!